As you can imagine, Dust of Dreams was the one book I was desperate to get hold of. And I did - but before I could buy it, my local library turned up with a copy. (I suspect a miracle, personally) And so I set to work, in the least onerous way possible - and found it was well, well worth the wait. But before I begin, just let me note that Dust of Dreams and The Crippled God were written as one novel, and more importantly - they read like it, too. So be warned: Dust of Dreams has a cliffhanger - but does, on the other hand, possess a conclusion. There is only one word that can describe Dust of Dreams, and that would be "epic". But perhaps that doesn't go quite far enough, so let's try "cataclysmic" - for, if not Erikson's apotheosis, Dust is certainly close. Overshadowing all is the ominous foreshadowing of an ending. Because an end is coming to the Malazan Book of the Fallen. After the eight previous volumes, each adding progressively more tangles to Erikson's uniquely Gordian knot, that knowledge is a burden on each page. 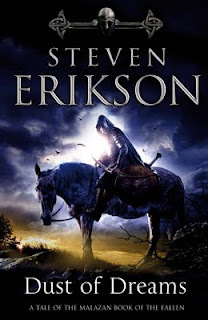 Is Erikson going to finish the Malazan Book of the Fallen - with the style, the flair, that has impressed readers and critics for his eight previous novels? And this theme is reflected in each of Erikson's tangled plotlines. For in the last bastion of the K'Chain Che'Malle, a (after all, merely) human Destriant, Kalyth, prepares to serve the final command of a matriarch driven mad by pain. The K'Chain Che'Malle seek humans - or the secrets of humanity's success - for the K'Chain Che'Malle must prepare for their last stand, in the brutal, new world that has defied them so many times before. In Lether, Fiddler prepares for a new and violent reading. But in Letheras, home of Elder gods and newborn warrens, not all will be as it seems - and this Deck bears hidden chains. And as the Malazan Army's allies seek to cross a continent, so do the Shake seek a - perhaps - more perilous path, driven by an ancient promise and a sea of blood behind, For the Shake journey to Kharkhanas, where Mother Dark mourns her firstborn son. Dark, ominous - and above all, epic -, Dust of Dreams begins to weave the scattered threads of Malaz into a saga that all turns about a fulcrum - a lone, battered army travelling into a war even they do not understand. Erikson's prose is almost lyrical, leaping from the natures of gods - and others - to a single soldier's view in the space of an instant, but with seemingly effortless grace. As the links between gods and warrens, realms and Elders begin to be made clear, Dust of Dreams delivers a new and frightening foray into Erikson's world. I only have one complaint - and that's that it has to end. I am going to have to get this series worked into my reading schedule here. I am hoping to maybe get it in here for next year. I have some books here that will take me up to the end of the year. But, I have heard wonderful things on this series and you make it sound even better. I like to read books by myself but I also like to read books with others so we can discuss it as we go. I think these would be perfect for reading with someone to discuss as we go through the books. I am going to have to see if I can get another to read these with me.